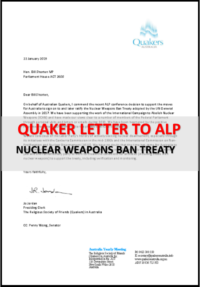 A letter, encouraging the Labor Party to sign and ratify the United Nations Nuclear Weapons Ban Treaty when in government, has been sent to Bill Shorten and Penny Wong. This action is in support of action being taken by ICAN (the International Campaign against Nuclear Weapons) to promote the Treaty. ← #Kids Off Nauru Canberra Rally – Politicians Miss Deadline!